If you have been impacted by the recent wildfires in Paradise, California your cat may be waiting for you at the Alley Cat Allies Recovery Center® located in nearby Marysville, California! Learn about TNR (Trap, Neuter, Return) programs for cats. Sometimes called catch and release, Trap-Neuter-Vaccination-Return, or Trap-Neuter-Release, TNR saves cats' lives. Spay/Neuter is good for cats and communities. These surgical procedures are performed by veterinarians to sterilize animals, making them incapable of reproducing. 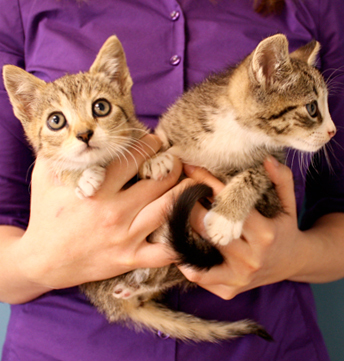 Find out more about the many benefits of Spay/Neuter for individual cats and communities! Looking for help with cats? You've come to the right place! Get advice about cats anytime, connect with local Feral Friends Network members and find the guides and resources you need. Protecting & improving cats' lives is what Alley Cat Allies is about. We are a champion for the humane treatment of all cats-pet, stray, and feral. Join us. Get the answers to some frequently asked questions about community cats, Trap-Neuter-Return, and Alley Cat Allies. Becky Robinson is President and Founder of Alley Cat Allies, the nation’s leading cat advocacy organization. She stands at the forefront of the global movement to protect and improve the lives of all cats. With donations from our supporters, we're able to help create programs that save cats' lives, teach communities how to help cats and kittens in their neighborhood, and respond to cats affected by natural disasters. See what our president and founder has to say on topics that affect community cats and all animals. Need help with outdoor cats? Our Feral Friends Network is a list of cat experts near you who can help with TNR and veterinary services. Connect now!